Dear Mona, I’m 32 and Live With a Roommate, Am I Normal? About 75 percent of that group of young adults is living with family, according to the CPS (all the data that follows is from the CPS). Before you feel smug about the fact that you’re not stuck living with Mom and Dad, remember that “living with family” includes individuals who live with spouses and offspring of their own. So you fit into the remaining 22.8 percent. Not so normal. 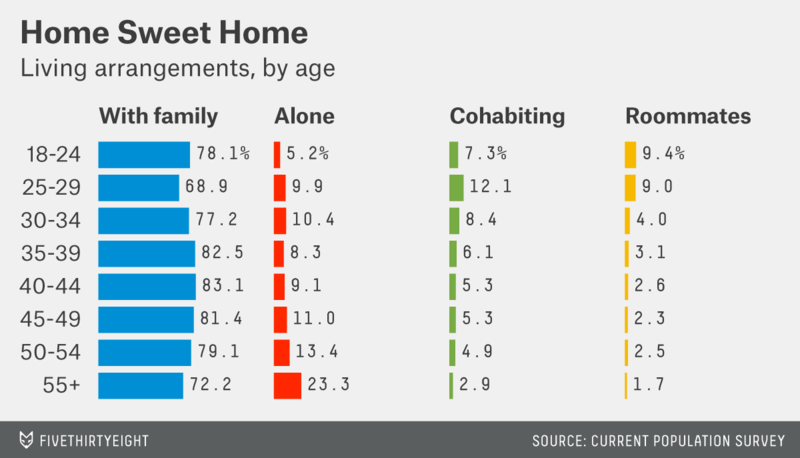 A further 10.4 percent of people your age live alone. We’re down to 12.4 percent. And 8.4 percent are living with a girlfriend or boyfriend. I’m afraid that means that you’re in the sliver — 4 percent of Americans your age — who live with a roommate. There’s a stigma around living with roommates in your 30s. Interestingly, our cultural expectations have flipped, and whereas once living alone in your 30s would have been seen as a mark of personal failure now living with a roommate is the real oddity. If that makes you sad, remember that in a few years time, you could be coming home to a different living arrangement. For 35- to 39-year-olds, the percentage living with a roommate slips to 3.1 percent; for 40- to 44-year-olds, it’s just 2.6 percent. That shrinking percentage doesn’t necessarily represent people moving in with partners; lives rarely move in such a linear way. As people get older, some may move in with roommates after a breakup or because the cost of living alone has become unaffordable. The only thing the data shows is that those movements don’t sufficiently offset each other, and, as a result, older Americans are less likely to live with roommates. As we’ve written before, America isn’t the only developed country where men and women have different living situations. But there are many reasons for those differences, including education, work and parenthood. In this case, the clearest factor we can point to is in the data. By the time they are age 25 to 29, 40.7 percent of American women are married. Only 29 percent of American men the same age say the same. In recent decades a growing number of women have decided that they are not going to wait for the right man to come around before “growing up,” and so they become an adult by getting a place of their own. When I was working on my book I was surprised to learn that young single women are significantly more likely to buy a home than young single men, who apparently don’t want to commit to anything. Adding other demographic factors into the mix makes you appear slightly more normal still. Looking at everyone your age with a college degree, the percentage living with a roommate creeps up a percentage point, to 5 percent. And you live in New York City; we can factor that in, too. 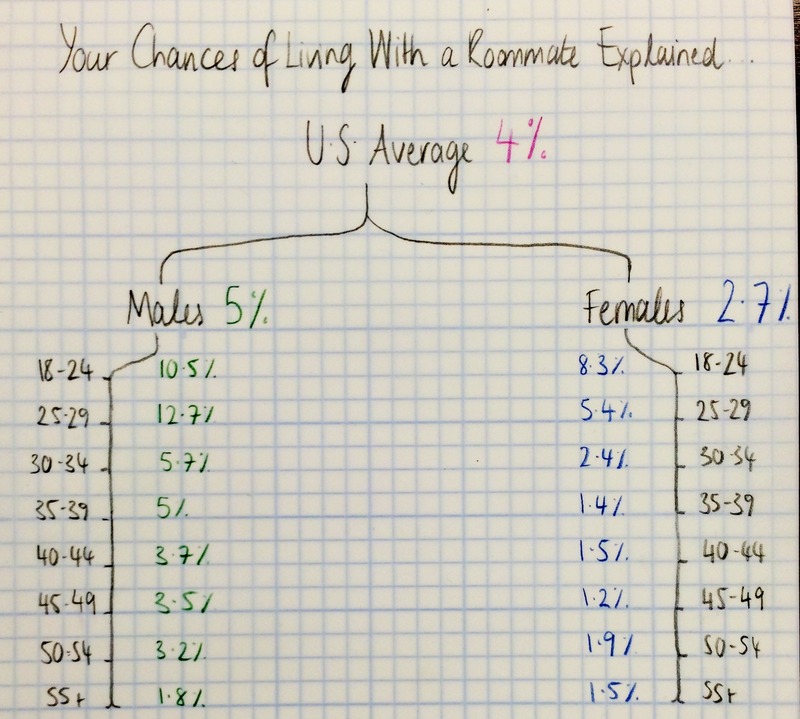 The percentage of people your age living in major cities with a roommate is 7 percent. Here’s another thing: You would have been weirder if you were around in the 1970s. Nonfamily households — aka roommates — made up just under 2 percent of U.S. households then, according to the CPS. But that share has risen steadily since, composing just over 6 percent in 2012. So, Micah, it turns out that living with a roommate at your age is a rarity in America. But taking into account your gender, where you live and your education level, it seems you’re … well, you’re still not normal, but you are a little less abnormal.